The fabulous 7th arrondissement in Paris offers the best access to everything we love and enjoy! It’s a beautiful old quartier that has maintained a village-like atmosphere, surrounded by bistros and shops so you can truly experience the joy of living like a Parisian. And of course, the 7th arrondissement is home to one of the world’s most visited attractions – the Eiffel Tower! For many of our guests their apartment with a view of “La Grand Dame” is the most memorable part of their vacation as they enjoy front row seats to the nightly light show from the comfort of their private balcony or living room. Enjoy a café’ au lait along the wonderful rue Cler market street, filled with cafés, restaurants, specialty food stores and fresh fruit and vegetable stalls. Do a spot of window shopping along Rue Saint Dominique or have a picnic in the beautiful Champ de Mars, a beautiful outdoor space with playgrounds, walking tracks and gardens at the base of the Eiffel Tower. You are walking distance to many of Paris’ most popular sights including Invalides, Ecole Militaire, Army Museum, Rodin Museum, and the Orsay Museum. You can also cross the river to the Right Bank for fabulous world-class shopping or hop on a bus or train to Notre Dame, Louvre, department stores, Moulin Rouge and more! The 7th arrondissement is one of the safest in Paris; it costs more to invest in the 7th, but to us, it is worth every penny. We greet our butcher, baker and local cheese specialist daily. They know what our favorite cheeses are and make their suggestions. They know the exact kind of baguette we want each day, not too brown and crusty for soft cheese. That is what we have been lucky enough to find in our neighborhood and we hope you’ll have a chance to enjoy the same special lifestyle. 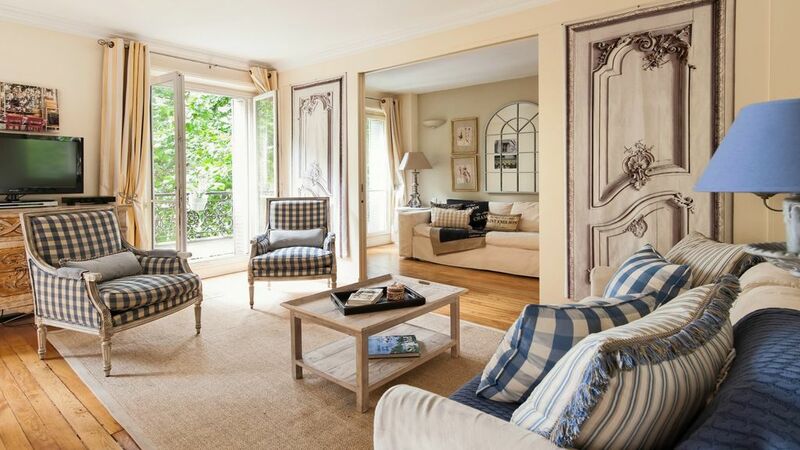 Decorated in a cheery French Provençal style, the popular Saint Julien is a gorgeous and sunny apartment featuring large French windows facing onto the beautiful Champ de Mars Gardens and a view of the nearby Eiffel Tower through the trees. Features 1 bedroom, 2 bathrooms and a modern kitchen - complete with Nespresso machine! Bathroom 1: Master bath has full-sized bathtub with shower, sink, storage. Bathroom 2 (en suite): Glass-enclosed shower, toilet, dual sinks, cupboards. Separate powder room with toilet, sink, storage. Two powerful air conditioners: excellent mobile units which cool the apartment beautifully. In living room and bedroom - CNN, BBC and other English channels available. 2 DVD players - dual-standard so you can bring your own movies or rent French ones nearby. Lovely apartment, perfect location. We stayed at a rue St Dominique apartment with you before, so we're happy enough to return. Posting your stays are so helpful to those who are looking for a place.